Delightful Doll Houses - A Guide For All Who Enjoy Them! Toys are the best companions for children. They keep them happy, active and help them develop into better adults. Very few toys are as ideal for stoking the imaginative power in children like doll houses. Doll houses open up a sea of possibilities for children to play. Children of any age ﬁnd these little houses enjoyable to play with. But did you know that the initial doll houses were not made for kids to play, but for adults to display their wealth and status in society? However, today these are perfect playthings that allow space for freedom, imagination and emotion. Children set up their mini houses and create scenarios that resemble a family setting that is familiar to them. 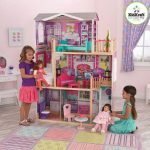 From simple structures to elaborate and exquisitely detailed designs, now you can ﬁnd a plethora of doll houses that add value to any collection or child’s play toys. In today’s social media-centric world you can see doll houses online and in museums besides being played with by kids in residences. 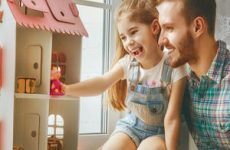 It is easy to share the joy of owning a one with others over social media, and therefore there is a new surge in the popularity of dollhouses now. The younger generation is becoming enthralled by the magic these small but elaborate houses weave with their variety and beauty. 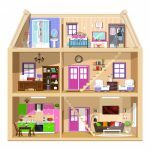 This article will take you through an entertaining and enjoyable doll house journey, making you aware of the various types, styles, materials, designs and accessories that are currently available. The beauty of a dollhouse is that it resembles a real house, but in smaller dimensions. You can sit before it, open the door or windows and have a peek inside or be more adventurous and remove the roof and get inside! This can be done on some large scale doll houses. Dollhouses are private possessions that are cherished for generations. Some of the exciting and ancient 18th and even 17th century miniature doll houses can be seen exhibited in museums. These were primarily created as private possessions to be kept within family and shown off as a symbol of wealth to the visitors. In some regions these miniatures were used to educate the daughters in the family on how to manage the household! And these little houses are loved and cherished not only by children of any age, but also by adults. For adults, it is a journey back in time, when they were little kids and enjoyed the miniature houses with pleasure. The concept of doll house has its origins way back, about 400 years ago. Initially, the miniatures were replicas of the rooms and were used to develop new trends and styles in decorating homes. This tradition soon evolved into doll houses transforming into accurate and elaborate depiction of real houses. While earlier these houses were only possessions of the elite, in the wake of the Industrial Revolution the miniatures became more affordable due to mass production. 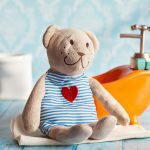 While earlier they were considered too precious to be handled by children, when they became affordable after World War II, they turned into a popular children’s toy. Now these have turned into a big industry with a diverse range of styles, types, sizes, themes and other variations that keep children delighted to no end. 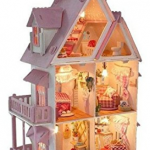 Sites such as this one have an attractive collection of such dollhouses that appeal to kids and adults alike. Now you get toys of various types, scales and styles. 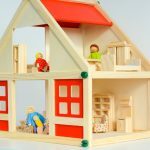 Even if the purpose behind the doll house construction is the same, you can ﬁnd two main ways in which these toys are created. Most of the doll houses in the United States are of this type. The front portion is an exact replica of a real house, while you have an open backside for kids to play with easily. These dolls have opening right in the center. When you close the house, it has a look identical to a completely constructed house. When opened you have play rooms on either side. The hinged houses limit interior access and have split up rooms, making it difficult for playing. Doll Houses are made to a speciﬁc scale as they are often modeled on real homes. If you are purchasing one for your child, you need to consider the scale of the little house as this will help you ﬁnd the right accessories that go well with the miniatures. Large scale doll houses used dimensions like 1:18. The houses are created for younger children who will ﬁnd it easy to play with and manipulate. While the pieces or parts of the house may be of large size, the house itself is not expansive or big as the houses are for little ones, especially pre-schoolers. Such houses have large size but fewer rooms. This is a frequent substitute for the large scale doll houses. Scale used is around 1:12. These are for adult collectors or older children. The pieces are smaller and difficult to manipulate, hence they are more popular with adult collectors. These small scale houses have more rooms and are meticulously detailed. These have no speciﬁc scale and are designed based on personal preference. The only thing to note while buying these custom houses is that the scale of the house should match with the accessories and dolls. Doll Houses also resemble real houses in style. You can ﬁnd elaborate Victorian houses, Beach bungalows and Modern architecture too. Farmhouse, Cabin, Georgian, Cottage, Colonial, Lighthouse, Log Homes and Historical homes are a few styles that are hugely popular with kids and collectors. There is however restriction in the external style as interior space is required. The detail actually depends on the expense and on the type of customer it is intended for. Different types of materials are used for building doll houses. Since these are basically toys, the materials used are of lightweight category such as Balsa Wood. The material chosen depends on what components go into a doll house, such as the number of doors and windows. The functionality and how good a doll house looks are inﬂuenced by the choice of material. Here are some commonly used materials. Each has its own properties that make it excellent for miniature toy creation. These have a natural look and have a close resemblance to real houses. Adult collectors prefer wood doll houses because of the authentic look. These are not for children as they can easily break and are also expensive. You can see some really good doll houses that are not only appealing to look at, but serve as quality toys for children. The early houses were mostly made of metal. While the material is affordable, using such doll houses should be considered with care as the metal is prone to warping and chipping. Plywood, especially Lauan plywood (Philippine mahogany), is used for building cheap dollhouse kits. Although easy to work with, the material requires plenty of ﬁnishing. Most often it is die cut. Instead of screws and nails, slot and tabs are used for assembling the individual pieces. Medium density ﬁberboard (MDF) is used for making doll kits and full constructed doll houses. Like the plywood houses these are assembled using slots, tabs and glue. When heavier material is used, glue and nails are used for assembling. 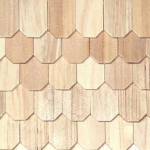 The toys are light in weight and inexpensive, but they need shingles, siding or other exterior decorations to make them resemble genuine houses. To choose a material that will be durable and retain the quality and craftsmanship, it is best to go for the heavy duty and thick variety of plastics. These make robust and durable models. Doll Houses made of wood on the other hand, give a traditional look and are best for passing down from one generation to another. Doll Houses are not complete without the right accessories. Yes, just like you decorate your home with furniture and other nick-knacks, doll houses too need special furniture, play sets, dolls and other things that you ﬁnd in a real home. These accessories enable endless hours of engaging and fun ﬁlled playtime. When you buy a doll house for your child, it is just the beginning. Without the right accessories, a little house is not as fun to play with. Therefore, it is important to know about the various accessories, so you can stock up a doll house with all that your child can dream of and more. They are generally bought to suit existing dolls or the new ones. Mostly people choose the dolls ﬁrst and then search for a house that the dolls would look good in. Therefore, while purchasing doll houses, you need to make sure they ﬁt with the dolls you have. Decorative dolls need an equally elaborate doll house, while there are other dolls that are just for play. The initial models placed signiﬁcant importance on furniture. This trend has continued to the present-day miniature toys. 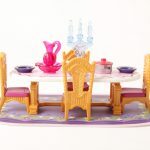 You can ﬁnd almost any type of furniture in miniature size that resembles the real furniture accurately. While some kids are satisﬁed with just the dolls and doll houses, older children show speciﬁc preference for the furniture. Just like the dolls and furniture, the appliances should be picked out to reflect the age and scale of the house. Most of the doll house models come with inbuilt appliances like microwaves, TV, washing machine, etc. Despite these inclusions, children love to add on new appliances to up the fun quotient. From ﬂat screen LED TVs to coffee makers, you can ﬁnd numerous miniature appliances for these little houses. This is especially true in case of historical home models that need historical appliances to accentuate the classic style. In addition to furniture, dolls and appliances, there are several other accompaniments that you can add to a doll house to amplify its appeal. Lights, books, toys, rugs, miniature art, fruit and other such accessories add fun to the houses. But these are also quite expensive. As you can see the possibilities are endless when you think of accessories. The beauty here is these can be bought along with the doll houses or added on later. 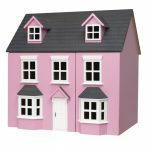 Regardless of the mind-boggling range of doll houses that you ﬁnd now, special doll houses do exist that meet all tastes and all budget ranges. Compared to other toys, they can certainly cost more, but they last a long time and provide a host of beneﬁts. Not to mention the unbridled joy they bring to any child they belong to. And don’t forget the boys! There are heaps of gender-neutral dollhouses available today. 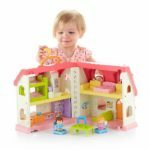 With the ultimate doll house you buy for your child, you can bring years of joy to their lives and the doll house would stay forever as part of the child’s cherished toy collection. And these little houses are a big source of entertainment not only for children but adults too. With the diverse options you have on the various styles, types, scales and themes it is vital that you make an informed decision prior to the actual purchase. Since the preference of children differs with age, it is best to consider all the guidelines and tips outlined in this article. 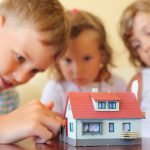 With all the information provided here, you can consider the doll houses in a better perspective, sort through various options and arrive at the ultimate house that will bring joy to your child. And it also serves as the best tool to inspire creativity and nurture all round development in your child for years. For information and reviews on today’s popular doll houses click here!